Welcome to Happy Day Farm. 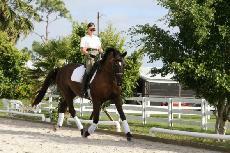 A horse friendly dressage farm on 15 beautiful acres in White Fences, Loxahatchee, Florida. Our focus is a friendly, professional atmosphere for our horses and clients. Boarding at Happy Day Farm means heaven for horses and offers peace of mind that your horse is in expert hands when you are not at the barn. Dry board, seasonal and year around are available. Training services are available, but clients are welcome to bring their own trainers to the farm. Click here for more information on boarding and photographs of the farm. Happy Day Farm has been in operation since December, 1986 and is owned and operated by Eva-Maria Stoebe. Eva M. Stoebe and "Hamilton"